On the first day of my arrival in Italy in 1986, I moved into a well-built 1950’s apartment with my Italian boyfriend who was to become my husband. 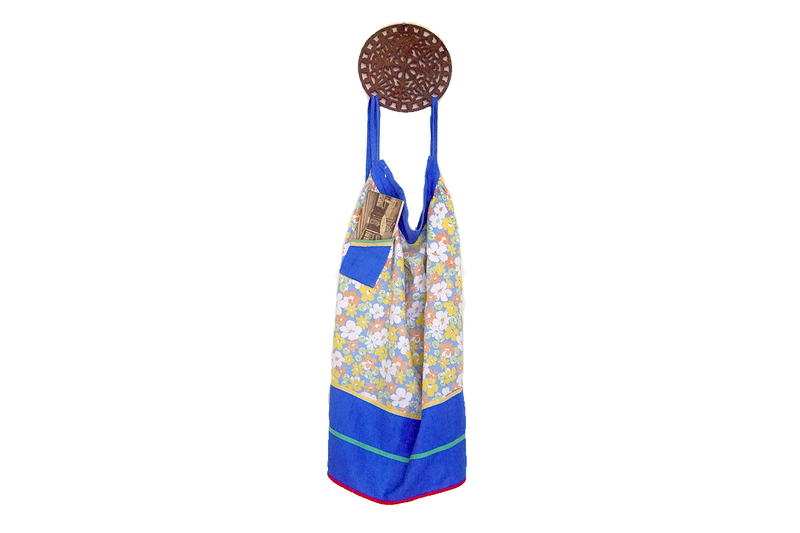 On that day, the neighbour next door, welcomed me to Italy with a long, brightly flowered apron, with several straps which she promptly threw over my head and wrapped around my body. Up until a few hours before I had been a young, care free English girl who had had 6 lessons in home economics in her life, in her rather academic English girl’s school. The dishes included Victoria sponge, trifle, and four other things that I can’t even remember. In that period, I was a mother living in Italy, with a young baby. We lived in the piazza of the village, Cocconato di Asti. On a bad day I would fling my apartment windows open and play, ‘Barry White’. He would tell me how special I was, remind me of England, family and friends, I would cook a lovely Italian dinner and life would be alright again. 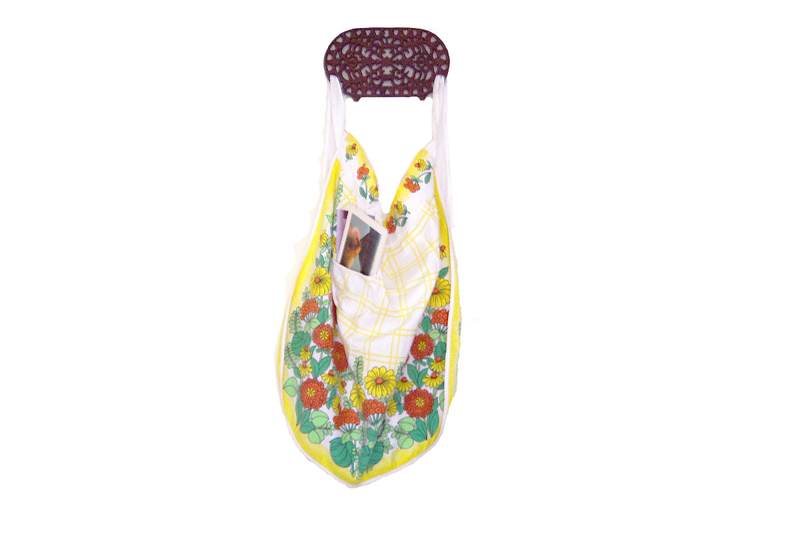 Since leaving Italy I have collected a range of kitchen aprons and had a great desire to create a piece of artwork, alongside some of my writing. Inside each pocket I have placed about 3-4 printed postcards of images from Italy and England. These images appear at first to be random. They reveal differences in sizes of postcard, quality of print and colour definition, all of which add a sense of nostalgia to the images found on the postcards. The images reveal a personal journey of experience, memory, loss and joy. They reveal the struggles and pleasure of motherhood. The mother is myself living in a foreign land, in a different culture, with a different language. Motherhood makes one remember ones one childhood; memories, walks, food, objects, words, smells and stories. The contrast between what people eat for dinner in the UK and what people eat for dinner in Italy has had a lasting impact on my life and cultural awareness. As a mother I became even more aware of these differences and realised just how important, “ What’s For Dinner”, actually was and is for ones way of living and life style.